It rained all night (so I’m told) and it was still raining when we met on the veranda just outside of the dining room from where we could see the river and an open area where bird feeders held lots of fruit. A few Passerini’s Tanagers dropped in as did a Grey-headed Chacalaca but a couple of mammals came down and devoured most of the fruit, they were Variegated Squirrel and White-faced Coati. 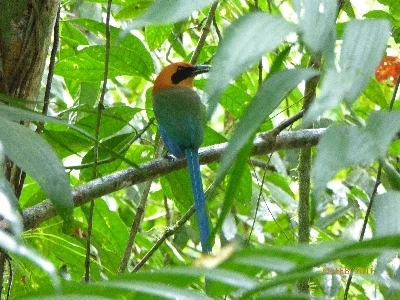 An Orange-billed Sparrow made a few fleeting appearances as did Red-throated Ant-Tanager but the strangely-beautiful Montezuma’s Oropendola gave us stunning views along the vibrant Summer Tanager a bird that shone in the dull, wet forest setting. After a short walk, during which we all got wet, we settled down for breakfast which was a lovely affair with a wide choice of food. At 8pm we were all finished and promptly loaded onto the bus for our day out to La Selva. This biological station consists of miles of forest trails and two or three large open compounds where accommodation for studying students, field study centres and dining areas are found, a large ‘rope’ bridge spans the River Saripiqui and circulars trails lead off in several directions on either side of the river. As we arrived the rain stopped, a miracle! We all jumped off the bus along the approach track to La Selva to look at a Grey-headed Kite which had perched in the open and as usual one bird led to many others. We were greeted by our guide for the day Manuel who began with a short speech about the centre and the trails, we then spent the first hour around the main compound as Manual and Roy pointed out several excellent species, the best of which included Paltry Tyrannulet, GREAT GREEN MACAW, Dusky-faced Tanager, Olive-backed Euphonia, Black-necked Aracari and so many more. 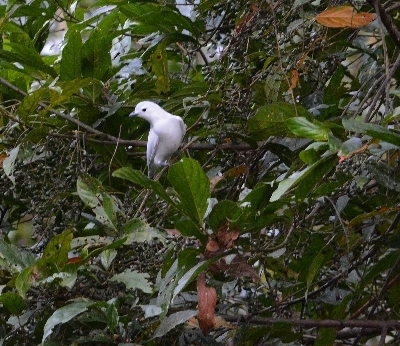 Our walk started but we didn’t get far as a Rufous-tailed Jacamar held us up by perching out in the open and the another star bird appeared, the beautiful all white SNOWY COTINGA, what a stunner. We also saw a Black-billed Toucan in the distance. We followed a track that led through the forest making frequent stops and I can’t list all of our sightings as they were too numerous but I can say we had a superb morning, the light improved all the time and eventually the sun came out, hooray. 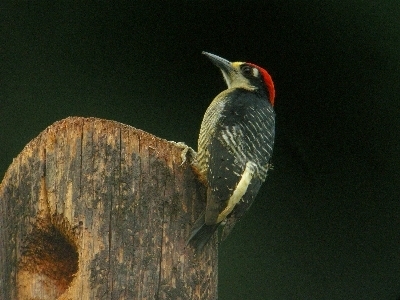 It was because of the recent, prolonged rain that the birding was so good. 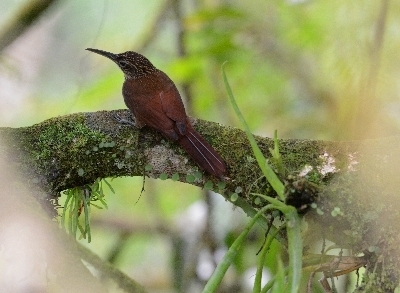 A pair of Band-tailed Barbthroats tended their hanging nest, a few giant Iguanas sat high up in the trees and all kinds of exotic motmots, toucans, parrots, jacamars were found all levels in the forest. 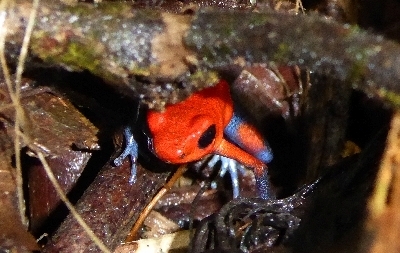 On the ground we saw Poison Dart Frogs, some beautiful butterflies and a few brightly coloured flowers. Back at the compound we had a much appreciated cooked lunch and at 1pm we were back on the trails, this time we crossed the river using the ‘canopy-bridge’ which brought us into an open compound where the field study centre was situated and it was mammals that drew most of our attention to start with. 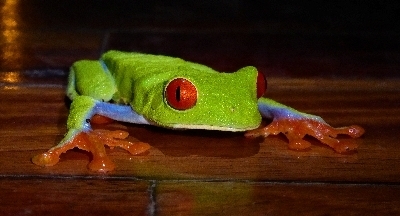 We were shown some Long-nosed Bats, a Three-toed Sloth, Variegated Squirrel and a small heard of semi-tame Peccary. Once on the track we found a Tyra and a Coati and a lot of nice butterflies. 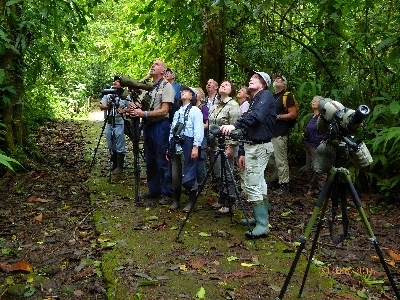 You would think that birding in the mid-afternoon in the rain forest would be uneventful but it certainly wasn’t the case today we found many bird species as well as Spider Monkeys and Red Howlers. The main highlights were Purple-throated Fruitcrow, one was seen and heard but in poor light, Olive-Backed Quail-Dove, very hard to see on the forest floor, Black Currasow on the track, a couple of nice wrens, White-breasted Wood-Wren and Stripe-breasted Wren. We also saw well, Rufous and Broad-billed Motmot, Rufous-tailed Jacamar, another superb Snowy Cotinga, White-collared Manikin and several woodcreepers, woodpeckers, tanagers and flycatchers. It was a superb day out in a wonderful place, everyone enjoyed themselves. Before we left for our lodge we stopped in a side entrance to the park where open fields had some huge trees sparsely scattered about. We scanned the trees and found A couple of Bat Falcons, a Great Green Macaw, Black-mandibled Toucan and many Orange-chinned Parrots. This finished off a superb day-out, we had listed 85 species and nearly a dozen mammals!